Whatever you are doing right now is determined by the way you are thinking. All your emotions—whatever you feel—are determined by your thinking. All your desires—whatever you want—are determined by your thinking. If your thinking is unrealistic, it will lead you to many disappointments. If your thinking is overly pessimistic, it will deny you due recognition of the many things in which you should properly rejoice. Since few people realize the powerful role that thinking plays in their lives, few gain significant command of it. Most people are in many ways victims of their thinking; that is, they are hurt rather than helped by it. Most people are their own worst enemy. Their thinking is a continual source of problems, preventing them from recognizing opportunities, keeping them from exerting energy where it will do the most good, poisoning relationships, and leading them down blind alleys. This course will introduce you to the tools the best thinkers use, and will exemplify the activities and practice you can use to begin emulating them. Here are some of the qualities of the best thinkers. · The best thinkers think about their thinking. They do not take thinking for granted. They do not trust fate to improve their thinking. They notice their thinking. They reflect on their thinking. They act upon their thinking. · The best thinkers are highly purposeful. They do not simply act. They know why they act. They know what they are about. They have clear goals and clear priorities. They continually check their activities for alignment with their goals. · The best thinkers have intellectual “tools” that they use to raise the quality of their thinking. They know how to express their thinking clearly. They know how to check it for accuracy and precision. They know how to keep focused on a question and make sure that it is relevant to their goals and purposes. They know how to think beneath the surface and how to expand their thinking to include insights from multiple perspectives. They know how to think logically and significantly. · The best thinkers distinguish their thoughts from their feelings and desires. They know that wanting something to be so does not make it so. They know that one can be unjustifiably angry, afraid, or insecure. They do not let unexamined emotions determine their decisions. They have 'discovered' their minds, and they examine the way their minds operate as a result. They take deliberate charge of those operations. · The best thinkers routinely take thinking apart. They analyze thinking. They do not trust the mind to analyze itself automatically. They realize that the art of analyzing thinking is an art one must consciously learn. They realize that it takes knowledge (of the elements of thinking) and practice (in exercising control over those elements ). · The best thinkers routinely evaluate thinking—determining its strengths and weaknesses. They do not trust the mind to evaluate itself automatically. They realize that the automatic ways in which the mind evaluates itself are inherently flawed. They realize that the art of evaluating thinking is an art one must consciously learn. They realize that it takes knowledge (of the universal standards for thinking) and practice (in applying those standards). This course, as a whole, will introduce you to the tools of mind that will help you reason well through the problems and issues you face, whether in the classroom, in your personal life, or in your professional life. If you take these ideas seriously, and practice using them, you can take command of the thinking that ultimately will command the quality of your life. 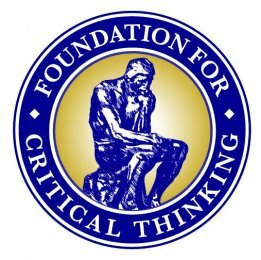 · Demonstrate understanding of the importance of fairminded critical thinking in the cultivation of fairminded critical societies. · Demonstrate understanding of the parts of thinking and how these parts work together in reasoning. · Demonstrate understanding of universal intellectual standards and their importance in human reasoning. · Demonstrate understanding of the barriers to critical thinking development and ability to intervene in thinking for the purpose of improving it. · Articulate and exemplify the primary concepts in critical thinking and how they can be used as tools for understanding, and improving, human reasoning. · Articulate understanding of the problems of media bias and propaganda as barriers to critical thought in human societies. · Demonstrate understanding of ethical reasoning; show understanding of the differences between ethics and other modes of thought, including religion, social ideologies, politics, and the law. · Demonstrate abilities in close reading and substantive writing. CT800S19 CT800 Critical Thinking: Tools for Taking Charge of Your Learning and Your Life $942.00	 Qty. CT800S19N CT800 Critical Thinking: Tools for Taking Charge of Your Learning and Your Life [4.5 Nursing CEU's] $1,042.00	 Qty. CT800S19P CT800 Critical Thinking: Tools for Taking Charge of Your Learning and Your Life [3.0 Philosophy Units] $1,137.00	 Qty.